TAKE NOTE: There’s a price trick for those of you able to attend the factory store in SE Portland–it is actually even more affordable to purchase your Bob’s products from the bulk section of the store! You save at least 20% in most cases grabbing your product there instead of prepackaged! Almond Meal (GF)–I’ve been getting Bob’s Red Mill’s Almond Meal since I lived back in the midwest! It’s great for different gluten-free cookie recipes, and it is one of the few “flours” I can have when we go on our cleanses. The best way to keep your almond flour good (because it can go south quickly) is to freeze what you don’t use! It will keep for a few months in the freezer and you can still use it straight out of there for whatever recipe you’re working on! Corn Meal (GF)–I just used a batch of this for our dressing at Thanksgiving! Follow the recipe on the back of the bag and combine it with the ingredients it calls for on the back (I sub maple syrup for the sugar) and voila! Delicious cornbread–which I then crumble and add to peppers, green onions, and more maple syrup! Bake and enjoy. I’ve been meaning to take the cornbread recipe and make muffins too but haven’t gotten around to it yet–if anyone’s made them into muffins let me know how it went in the comments! Refried Beans (dried)–This one cannot be found online (to my knowledge), but it is my most favorite item at Bob’s Red Mill. I wish they would package it for all to enjoy! Bob’s Pinto Refried Bean Mix is super basic and easy–it’s a pinto bean based mix and all you need to do is add boiling water and stir for 5 minutes (my attention span is not this long so I usually stir 30 seconds and leave it–shhh, don’t tell anyone!). This refried bean alternative is so much more flavorful than canned refried beans and I don’t have to worry about all the nasty things they put into preserving canned beans! My favorite recipes to use this product in are quesadillas and vegetarian enchiladas. Ok I’ll quit holding things up–on to the giveaway! I have many friends and family who are gluten-free full-time, and I think had I had this pack to start with, I might have been much more successful in the way of going GF 24/7! 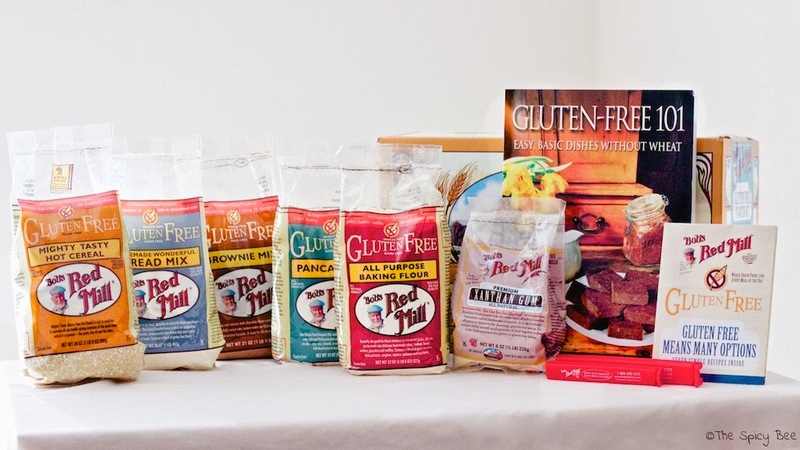 This sweet pack from Bob’s Red Mill includes All-Purpose Baking Flour, Pancake Mix, Brownie Mix, Homemade Wonderful Bread Mix, Mighty Tasty Hot Cereal, Xanthan Gum, Recipe Packet and Ph.D Carol Fenster’s book, “Gluten Free 101.” I feel like this could be the perfect gift to yourself! Giveaway ends December 5th at 11:59 PM PST. Open to Residents of the US only. Prizes cannot be shipped to PO Boxes. Winner will be selected by Random.org and be notified by email. Winner have 48 hours to respond before a new winner is selected. Please note that The Spicy Bee is not responsible for sponsors that do not fulfill their prizes. I have represented each sponsor with the expectation they will fulfill their prize and in a timely manner. I will contact the sponsor regarding your prize(s). The sponsors, in most cases, are shipping their items to you directly. I will make every effort to assist you obtaining your prize. If there is an issue with a sponsor, please notify the blog you won a prize from within 30 days for assistance, after that we may be unable to assist you. The product provided for the review was free of charge from the company. The product offered for the giveaway is free of charge, no purchase necessary. My opinions are my own and were not influenced by any form of compensation. Facebook, Twitter and Google+ are in no way associated with this giveaway. By providing your information in this form, you are providing your information to me and me alone. I do not share or sell information and will use any information only for the purpose of contacting the winner. Have you ever used Bob’s Red Mill Products? What Bob’s Red Mill Products do you always keep on hand?